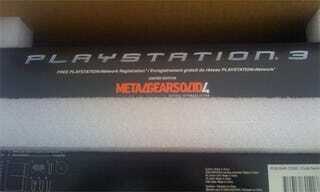 Couldn't get your hands on a gunmetal PS3? That's OK. Most people couldn't. That's not going to stop reader rupinderpaul from rubbing your faces in it. He's sent these pics in of his freshly-unboxed gunmetal PS3, and says of the new surface: "The feel of the console is much better than the regular piano black PS3; no more fingerprints for me!" Gunmetal PS3 Isn&apos;t Just A New Paint Job, OK?